It was very convenient. I will patronize from now on. . . . This review is about item#32620384. Because it is used on a ship with waves, I am afraid of the waterproof effect. I also have a solid exterior and want to repeat. 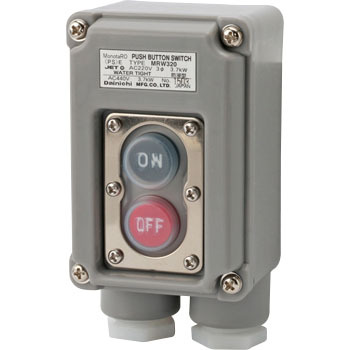 I use it for turning on and off the winch motor of the ship. The wiring was thick and it was hard to put in, but it seems that we can expect waterproofness accordingly. The price is affordable and satisfied. Although it is inexpensive, I think that the product is solid. I do not know exactly if I do not use it a bit, but I am satisfied for now. Since the manufacturer was a Japanese manufacturer, quality is no problem. I think that the price is a bit cheaper. It seems that waterproofness is also good. The problem afterwards is the durability of the rubber cover of the switch section, but nothing can be done without trying it. Since it can be used without performing curing work such as waterproof protection measures during equipment cleaning work, it will reduce man-hours. It was used for a brick cutting machine and a hydraulic pump unit. Because it is waterproof and dustproof, it is attached to equipment in a place where water is hung, and there are many dust. Because it can be used without problems so far, we are thinking that there should be no contact failure, electric leakage etc. as it is. However, I think that the rubber cover of the button will be able to rupture in the meantime, but I think that it would be good if replacement parts are available. It is being used as a push button SW of a pump etc. It was excellent in cost performance. It is easy to use and easy to install. I'm changing 3 or 4 items so far. Currently we have two cars in stock. Size and ability are also good. Because it is a resin, I do not have to worry about rust and I want to purchase again! It is compact and has good anti-immersion function. I also want a breaker integrated type in the future. In terms of sales, I would like to have a discount of about 10 at least. We are very satisfied with the response from ordering to shipping very quickly. It is used as a switch of a power-driven device attached to a large machine, but since it is used without attaching it to a wall, it is good if there is a work for obstructing the wall fixing hole every time and there is no back side hole. It is good to have a small outer shape because the installation is from the inside, but it is good because there is a rubber packing at the place where waterproofing is necessary, but if you do not stick to the size, the Kasuga product may be better. It was perfect with a code of thickness 2.0. Since there is a possibility of deterioration of rubber packing, I want you to attach screws for attachment to pillars etc. to the outside of the case. The case seems unreliable with plastics, but since it is solid, making it satisfactory for use in buildings.